I have just finished my 22nd year as a full time public school music teacher. Add to this years as a church musician and part time teacher, I have 35+ years of experience making music with children. When I think back to that first year of teaching, there is plenty to laugh about! What subject/age and where were you teaching? 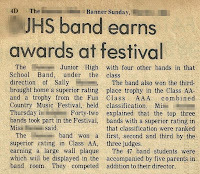 My first job was teaching junior high band in southern Oklahoma. I was also, as you might guess, the assistant at the high school, in charge of the auxiliary units. High school band rehearsal started early in the morning, before school, and continued through first period. Then, I had to get in my car and quickly get to the junior high before the 2nd period bell rang. This was small town driving, so traffic was never an issue, but I still had to manage to get OUT of the high school in time to make the mile and a half drive and open the door before students began arriving. No staying after class for anything! Always have the junior high band room set up before leaving school in the evening! My first classroom was in a building that housed the choral room, band room, and woodshop. I really had plenty of space in the rectangular shaped band room for the number of students that I had. There was a pretty large instrument storage room on one side that was designed with 2 doors to make the flow of traffic go smoothly. I had a decent sized office at the other side of the room. The office was connected to the music library/instrument repair station. I thought this was the coolest feature in the place: a nice sized worktable with a mouthpiece puller attached to the end and a nice assortment of appropriate tools. The folks in this town appreciated good bands, and this place was well supplied. Were you given supplies and materials? It has been too long ago for me to remember the exact budget, but I know that I did not lack for anything that I wished for. I was able to order music, attend state conference, and order new instruments when I needed to. I remember being very excited to order a set of tubular chimes and then selecting music that required their use. I would be remiss if I did not mention one "supply" gift that was provided to me by the shop teacher and his students in the classroom next door. Not long after school started, he showed up at my band room with this present! Yes, I still have it! I was never good at using it, and we certainly can't use anything like this today!! What do you remember about your first day? As an assistant marching band director, we had been having high school marching rehearsals for about 3 weeks before school started, so I had already been working. On the official first day of school, I remember walking in to the main building at the junior high. The lady in the hallway said, "Oh, you can't come in until 8:15." That stopped me in my tracks. I thought I was supposed to report for work at 7:45. While I was standing there, mouth open, trying to figure out what to do or say, the chorus teacher came around the corner. She said to the lady, "Let me introduce you to our new band director." After everyone finished laughing, I realized that the lady was another teacher on hall duty, and thought that I was a student! I know I looked young (I was only 21), but I didn't think I looked like a junior high student! <--My band photo from the yearbook! What was the hardest part of your first year? The hardest part of my year was 5th period Brass & Percussion class. This class consisted of 25 seventh grade boys who came to class directly from recess. Oh my, they were lively! And loud! I definitely learned then that you must be careful what you pray for. Never pray for patience, because you might end up with situations that require you to practice using it! I was oh so grateful that 6th period was "planning." What was the best part of your first year? The best part of my first year was watching those lively seventh graders grow as musicians. By the next year when we combined the woodwind class and the brass & percussion class into one band, those kids played some awesome music, earned superior ratings at contest, and even presented a MARCHING show at the junior high football game. They were some great kids! What did you discover your first year that you didn’t learn in college or student teaching? I really felt that I had been wonderfully prepared to be a band director by my Oklahoma State University professors, especially Hiram Henry and "Prof" Paul Montemurro. Even so, I learned a few things my first year. Did you know that high school boys could delight in playing matchmaker? Those boys in the French horn section were forever trying to set me up with any of the single male teachers at the high school. One time, my office phone rang DURING 5th PERIOD (you know about that class, right). It was one of the h.s. horn players who said, "Here, Mr. X wants to talk to you." My brass & percussion class is getting louder and louder. Mr. X actually asked me out. I don't remember exactly what I said, but it was something like, "I'm REALLY busy right now!!" No date for him! Did you know that a great place to hide the teacher's keys is in between the crash cymbals on their stand on the percussion cart? It took me 3 days to find them. Thankfully, I had a backup set of car keys. Beginning on that day, I never keep car & school keys on the same ring. Did you know that a seventh grade boy could be locked in a tuba case? Yes, I discovered PeeWee when I heard a noise in the instrument room during my "moment of silence" following brass & percussion class. What if I had left the room to go sit in the teacher's lounge that day?! What is one thing you know now that you wish you knew then? 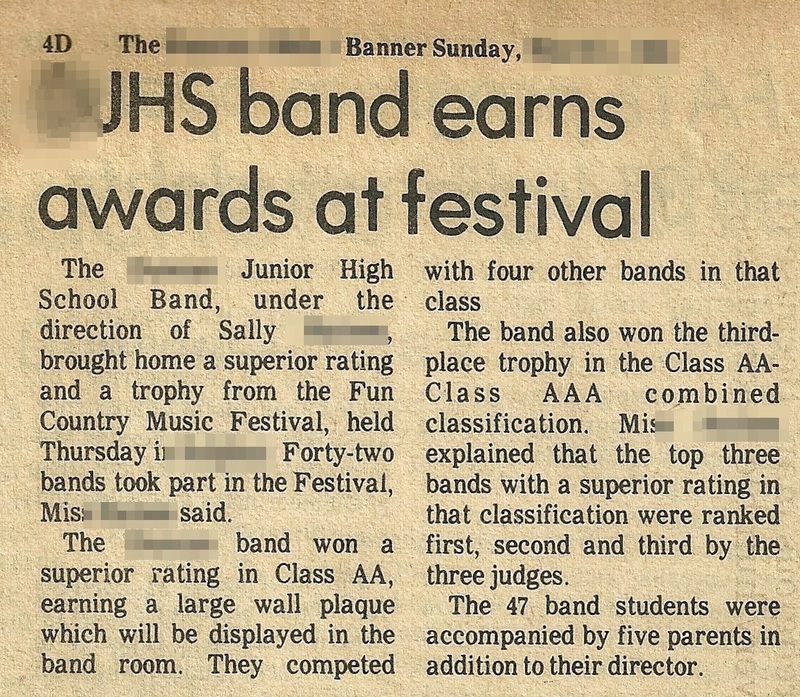 I wish that I had been better at working with parents to improve their students' experience in band class. This is definitely a young teacher weakness, and I surely had it. 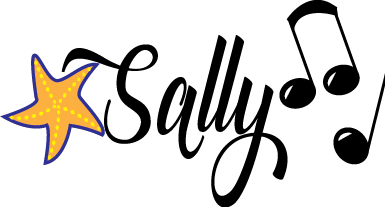 I mentioned that I had been well prepared in college, and this included plenty of discussion on dealing with individual parents and also band parents organizations. But information and experience are 2 different things! I was still VERY young, and I just didn't have any practice in this area. Ah, it has been great looking back to that first year! I was very young, enthusiastic, and confidence that I could be a great band director. I got this determination from my own great high school and college band directors. I certainly didn't know it all, but my determination to succeed helped me to seek out better ways to teach and reach students. My career has been varied, as my family has moved several different times. Each move required me to "reinvent" my musical self and learn more about teaching in church choirs, handbell choirs, private lessons, beginning band, and elementary general music. The common theme has been music! My favorite move has been to the world of elementary music. Here is where I feel the most at home. I certainly use my past experience in my current position. I am thankful to have had opportunities to learn & grow myself, and to sing & play & make music with children! Read more first year teaching reflections. 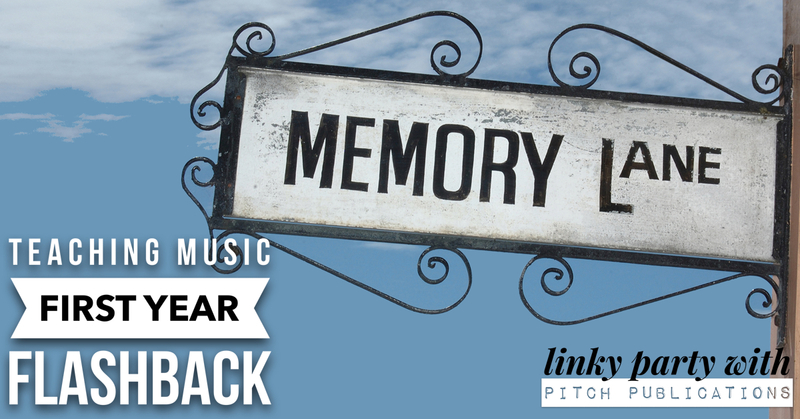 Check out the link up at Pitch Publications for more fun and funny stories about first year music teaching.